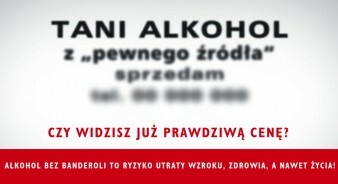 To increase awareness among Poles of the negative health effects associated with the consumption of illegal alcohol. To increase awareness that buying alcohol from unknown sources (without strip stamps) can cost one's health or even life. 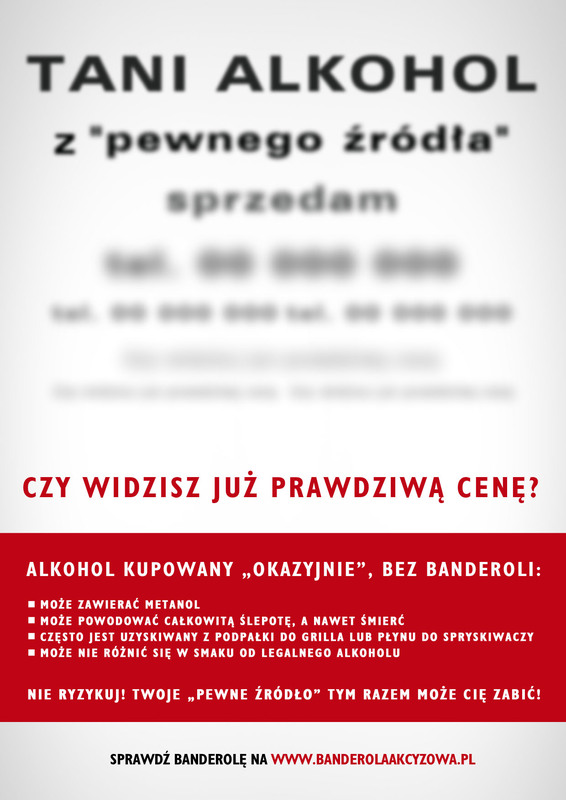 The campaign was a response to worrying data on the consumption of illegal alcohol in Poland. The purpose of the undertaken activities was to make Poles aware that there is no "reliable source" of illegal alcohol and that any bottle of an alcoholic beverage may contain substances which are health- and life-threatening. It was run over August 2013 in 3 chosen regions: north, north-east and south-west. These regions were chosen because they report the highest rate of illegal alcohol consumption. A number of outdoor and press ads were aimed at showing the message clearly and in an emotional way. 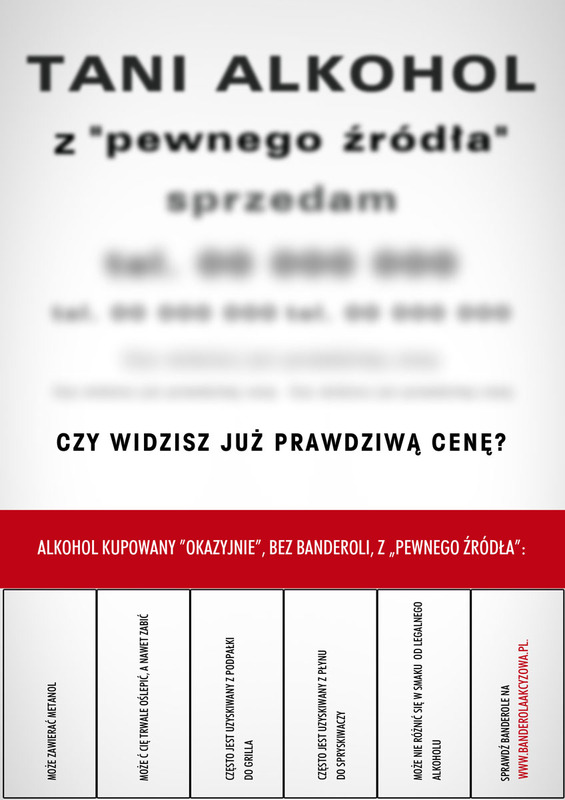 Minibillboards were located near bazaars, markets and potential places where it is possible to buy illegal alcohol. A number of buses also displayed full back billboards. Groups of "average Poles" were targeted through small town local radio stations to widen the campaign range. Posters were displayed near bazaars, markets, provincial offices, customs houses and at bus shelters and bus stations in order to reach "potential undecideds". Potential undecideds are those who may have come across illegal alcohol (in the target areas) and wanted to buy it in order to taste or because of the attractive prices (much lower than in legal points of sale). The campaign also included comprehensive PR activities directed at national media and bloggers. OUTDOOR & PRESS: 100 mini billboards were displayed, 15 press ads were printed and 18 buses displayed a full back. There were 18 publications in local and national press and 83 publications online. RADIO: 306 broadcasts were aired in 5 local radio stations. POSTERS: 1,900 posters were displayed. Almost half of respondents (45%) knew about illegal alcohol (alcohol sold without excise strip stamps). In their view, such alcohol is usually bought in the bazaars, markets or at the market. Respondents were reluctant to state their illegal alcohol consumption, however 17% admitted that they had been in contact with illegal alcohol. 3 out of 4 respondents stated that the main reason for buying alcohol from an unknown source is its low price. The respondents are aware of the health consequences of consuming illegal alcohol: 37% indicated a risk of poisoning or death (32%). Only 7% were not able to identify any potential health consequences caused by the consumption of illegal alcohol. The social campaign on the effects of alcohol was remembered by 12% of respondents. Nearly half of respondents knew of the campaign through newspaper (48%) and radio (46%). The campaign was seen as positive by 91% of the respondents, indicating its important role in informing and stating there should be more campaigns like it. 97% of respondents rejected the possibility of purchasing alcohol of unknown origin in the future.